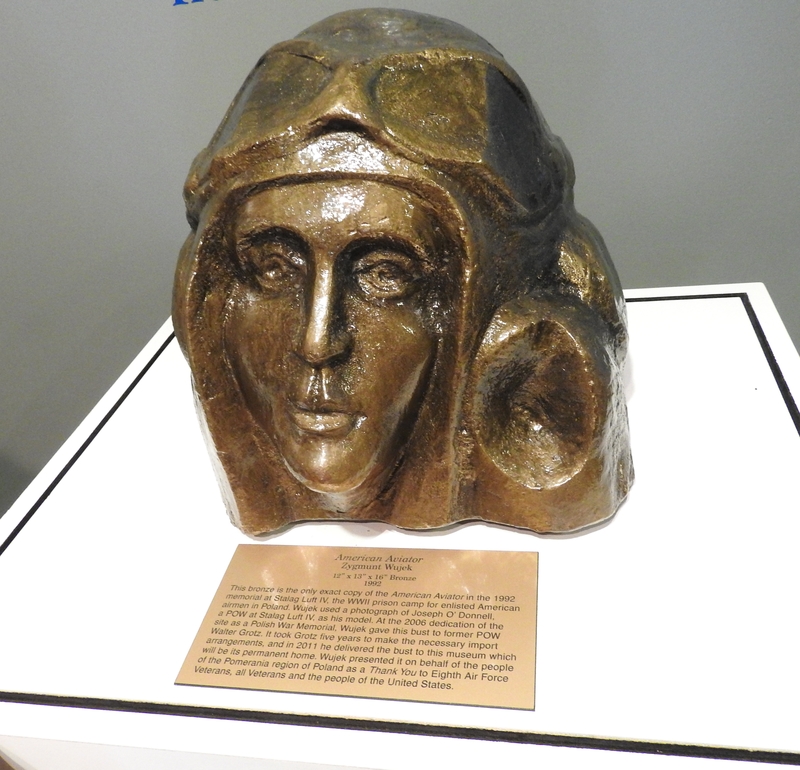 I met Polish sculptor Zygmunt Wujek in July 2017 at the Museum of the Mighty Eighth Air Force in Pooler, Georgia, near Savannah, during a gathering of descendants of WWII POWs. 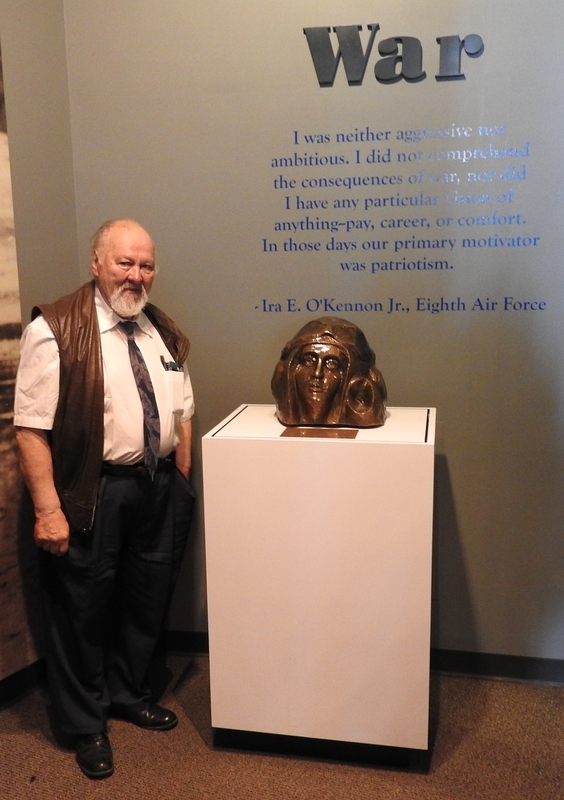 In the above photo, Zygmunt is pictured at the museum with his American Aviator bronze bust. The American Aviator is one of more than two hundred works Zygmunt created in his native Pomerania. Among Zygmunt’s many works were monuments commissioned by Lech Walesa to mark the entrance to Stalag Luft IV. To see photos of Stalag Luft IV then and now, including the monuments created by Zygmunt Wujek, please visit this POW site. the only exact copy of the “American Aviator” in the 1992 memorial at Stalag Luft IV, the WWII prison camp for enlisted American airmen in Poland. Wujek used a photograph of Joseph O’Donnell, a POW at Stalag Luft IV, as his model. At the 2006 dedication of the site as a Polish War Memorial, Wujek gave this bust to former POW Walter Grotz. It took Grotz five years to make the necessary import arrangements, and in 2011 he delivered the bust to this museum which will be its permanent home. Wujek presented it on behalf of the people of the Pomerania region of Poland as a Thank You to Eighth Air Force Veterans, all Veterans and the people of the United States. Note: The POW from whom the American Aviator was modeled, Joseph O’Donnell, was the author of the series of “The Shoe Leather Express” books. My father, George Edwin Farrar, was one of the American aviators imprisoned at Stalag Luft IV during WWII, and so this particular work of Zygmunt Wujek has special significance to me. I have not been to the site of Stalag Luft IV to see the remains of the prison camp or the memorial erected there, but seeing and touching this memorial to all the men with whom my dad shared this part of his past sends waves of emotion though me. I am thrilled that we have such a monument on American soil to remind us what these men sacrificed for us so many years ago. Next year, 2020, will be the seventy-fifth anniversary of the march of prisoners out of Stalag Luft IV. Plans are in the works to mark the anniversary at the memorial site and across Germany following part of the path of the march. I know Zygmunt would have taken part, but sadly Zygmunt Wujek died on December 22, 2018. On Saturday (22 December ), a sad news came. At the age of 80, Zygmunt Wujek, a sculptor from Koszalin, a medalist, painter and draftsman and a social activist died. He became famous as the author of over two hundred monuments, including Jan Stawisiński, Victims of Bolshevism, General Władysław Anders and Martyrdom of the Polish Nation. Zygmunt was born on September 22, 1938 in Rawicz, Poland. He studied sculpture at the State Higher School of Fine Arts (currently the Academy of Fine Arts) in Poznań. In the capital of Wielkopolska he was a participant in the demonstration of support for the workers’ protest in June 1956. He worked as an instructor at the Youth Culture Center in Poznań, but in 1965 he came to Koszalin. Here he was a teacher at the Technical School of Building, and later a sculpture teacher at the State High School of Fine Arts and a lecturer at the Design Institute of the Koszalin University of Technology. He was an activist of the Union of Polish Visual Artists. Awarded many times, including decorated with the Gold Cross of Merit, the Mater Verbi Medal and the West Pomeranian Griffin. The news about the artist’s death is a huge loss for the Koszalin culture and a surprise for a group of his friends, because Zygmunt Wujek, who was still active, had many plans for the next year. A more complete biography is included Zygmunt’s full (translated) obituary here. But something is missing from this summary of Zygmunt’s life. What formed the man is not the list of his accomplishments, but the impressions that formed in his young mind when he was growing up in Poland. Zygmunt was born during a terrible time in the world, during the rise of Adolf Hitler and the Nazi party. Barely over a month following Zygmunt’s birth, over 15,000 Polish Jews living in Germany were expelled without warning. They were loaded in boxcars and dumped at the Polish border. Weeks later, the Nazis coordinated widespread attacks on Jews throughout Germany in an event call Kristallnacht – the Night of Broken Glass. Shortly before Zygmunt’s first birthday, the Nazis invaded Poland, initiating WWII in Europe. Britain and France demanded Germany withdraw its troops, but instead the Luftwaffe raided Warsaw. In September of 1939, Britain, France, Canada, Australia, and New Zealand all declared war on Germany. Before the end of the month, Warsaw surrendered to the Nazis. In the early years of Zygmunt Wujek’s life, his country was under Nazi occupation. Concentration camps arrived and the extermination of Jews began. Stalag Luft IV opened in May 1944 for the imprisonment of captured allied enlisted airmen. On January 17, 1945, with Zygmunt only six years old, Soviet troops captured and liberated Warsaw from Nazi control. On the 26th, the Soviets liberated the Auschwitz death camp in Poland. On February 6, with the Russian Army approaching, the POWs of Stalag Luft IV were made to gather their belongings and march from the camp, beginning their eighty-six day odyssey out of Poland and across Germany. Until VE (Victory in Europe) Day, May 8, 1945, Zygmunt Wujek had known nothing but war in his life, but now at school age, those terrible times would become memories, but memories that would last a lifetime. It is impossible to think of the memorial at Stalag Luft IV without remembering Zygmunt Wujek. Though he will be greatly missed by family and friends, including the daughters of Stalag Luft IV, his memory will live on through his works of art, and especially for me, his memorial sculpture for the airmen of Stalag Luft IV and the American Aviator. By thearrowheadclub in Stalag Luft IV on January 30, 2019 .